One of the best books I’ve read this year is Canadian Chris Hadfield’s An Astronaut’s Guide to Life on Earth. Easy to read, this book gives insight into the training and life of an astronaut as well as profound insights about a career and living life. A career trajectory looks pre-ordained on paper. The reality is different. Chris Hadfield decided at age 9 to become an astronaut after watching Neil Armstrong step onto the Moon. At that time the chances of him succeeding in this career goal were zero. Astronauts were American. NASA only accepted applications from US citizens, and Canada didn’t even have a space agency. He wasn’t destined to become an astronaut. He had to turn himself into one. A resume can make us look like there is a series of steps we took to take us to our current role. The reality may quite different. Plus, being picked doesn’t make you what you want to be. Being selected for a graduate program doesn’t make you a public servant, a lawyer or an accountant. There is still much to learn to turn into the professional we want to be. A few years ago someone proclaimed ‘Don’t sweat the small stuff’. They wrote books, ran motivational seminars and generated much ‘evidence’ that sweating the small stuff is bad for you. Chris writes about the importance of sweating the small stuff. He writes: ‘We’re trained to look on the dark side and to imagine the worst things that could possibly happen.’ By doing so, you become competent.’ For Chris, ‘Competence means keeping your head in a crisis, sticking with a task even when it seems hopeless, and improvising good solutions to tough problems when every second counts. It encompasses ingenuity, determination and being prepared for anything.’ [p36] In other words, it’s very useful to sweat the small stuff when it could save your life. Not everyone’s job is as potentially life-threatening as an astronaut. Wise though to pay attention to details that could make a difference to your performance. One of the misconceptions about astronauts is that they spend a lot of time in space. 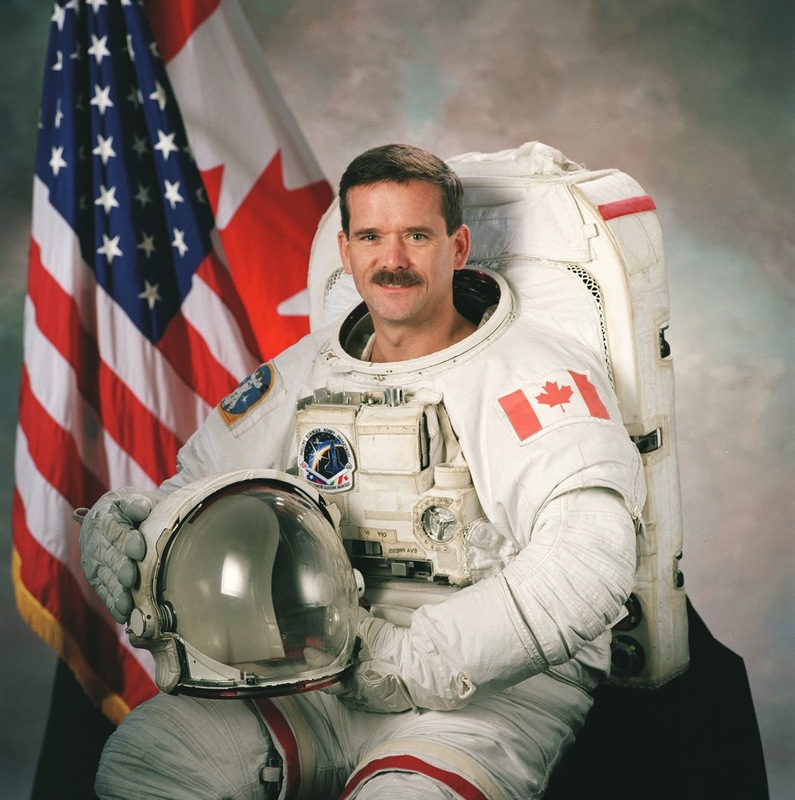 Chris Hadfield spent a total of six months in space out of a 21 year career. Most of that time was spent training to handle a vast range of dire situations in space, including pulling a tooth, removing an appendix, fixing the toilets and changing orbit to miss space debris. You can listen to his talk about this in an ABC interview. If we define our success only by the promotions we win we are likely to be disappointed much of the time. Chris Hadfield has a mindset of always getting ready, taking opportunities to learn more, when others might choose to ignore such an opportunity. Such a mindset served him well in positioning himself for being selected three times for space missions. 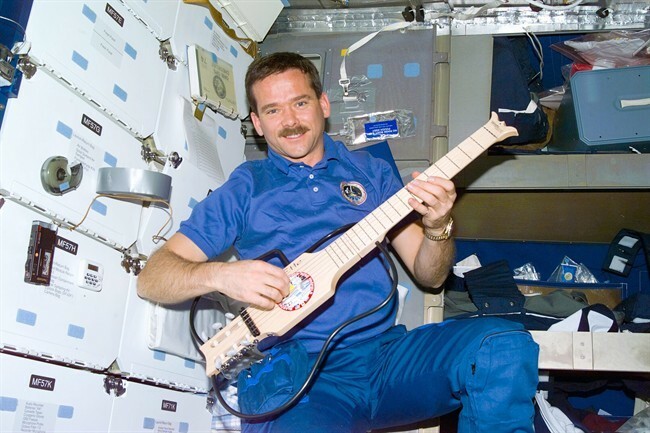 Chris Hadfield plays guitar aboard Mir in 1995 (Credits: Canadian Press/HO/CSA). He goes on to suggest that most of us applaud the wrong things: [p279] ‘the showy, dramatic record-setting sprint rather than the years of dogged preparation or the unwavering grace displayed during a string of losses.’ Most of us either have only a few showy moments or none at all. So it would be wise to do what Chris does – to make the most of our time on Earth. Yes, the ‘high-octane experience’ is great to have. But if we rely on these to have a sense of fulfilment, success, purpose, joy, then dealing with the stark realities of everyday life will be difficult. Chris does on to say:[p280] ‘The whole process of becoming an astronaut helped me understand that what really matters is not the value someone else assigns to a task but how I personally feel while performing it.’ As he puts it, better to have 10 wins a day than a win every 10 years or so. In his TED talk What I learned from going blind in space Colonel Hadfield makes a useful distinction between perceived and actual danger, using an example of spiders. He points out that there are hundreds of spiders in Canada, but only one is venomous, and then not dangerously so. This spider sticks close to the ground rather than weaving a complex web that you might walk into, and isn’t really much interested in biting humans. To conquer fear of spiders then, know the actual danger and then walk through many spiders’ webs to become accustomed to the feel and know that there isn’t a dangerous spider lurking in the middle waiting to grab you. In his book Chris explains: [p52] ‘In my experience, fear comes from not knowing what to expect and not feeling you have any control over what’s about to happen. When you feel helpless, you’re far more afraid than you would be if you knew the facts. If you’re not sure what to be alarmed about, everything is alarming.’ Preparation and knowing your options are a sound basis for overcoming fear. Whether it’s a job interview, presentation, difficult meeting, it’s wise to consider what could go wrong and figure out how you would handle it. Otherwise, when things do go wrong, you won’t know what to do. It’s a mystery to me why people don’t prepare for presentations and job interviews. While much of that preparation may not be actually used, the peace of mind helps reduce nervousness. If you hit snags, you’ll be prepared, you’ll know what to do. Plus, the process of preparing helps inform everything else, improving your overall performance. Much of this preparation means sweating the small stuff. Take note managers and leaders. It’s not about you. Helping others succeed is part of your role. Strong team members will make you look good and speak well of you. If it’s all about you your reputation will be one of arrogance and self-importance. So his advice is to enter a new environment with the intention of having a neutral impact, to observe and learn, and pitch in where possible. In other words, aim to be a zero, it’s an attainable goal. A similar point was made during the 2014 100 Women of Influence awards. Michael Rose, chief executive ­partner of international law firm Allens and one of the Women of Influence Awards judges, said there was a sense of authenticity and humility among the leaders. About the author: Dr Ann Villiers, learning guide, professional speaker and author, is Australia’s only Mental Nutritionist® specialising in mind and language practices that help people build flexible thinking, confident speaking and quality connections with people. Visit www.mentalnutrition.com to learn more about Mental Nutrition. Published with permission.